Arsenal have opened the scoring against relegation candidates Huddersfield, after just 16 minutes of play, thanks to a stroke of luck following Alex Iwobi’s volley. The Gunners looked wide awake whilst Huddersfield looked half-asleep, Henrikh Mkhitaryan – who has just returned from injury – showed his playmaking talents by threading a lovely ball into Sead Kolasinac. The Terriers allowed Kolasinac all the time in the world and the Bosnia international picked out Iwobi with a lovely cross, the winger watched the ball float in the air before lashing a volley towards goal. Iwobi’s volley was deflected by Terrence Kongolo and goalkeeper Ben Hamer was left bamboozled and the ball hit the back of the net. 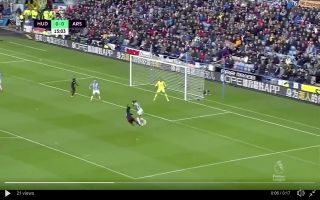 This is the kind of play that Arsenal fans expect from their team, the Gunners were able to pick apart Huddersfield with ease here, despite just three players being involved in the move.